Dr. Méabh Ní Fhuartháin who will give a talk on Fr. Henebry. 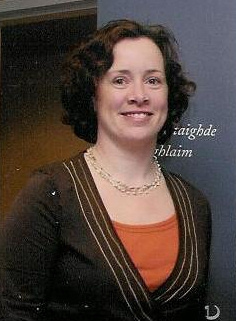 Dr Méabh Ní Fhuartháin is currently Co-ordinator of the BA with Irish Studies at the Centre for Irish Studies, NUI Galway. A native of Waterford, she returned to Ireland following graduate work and lecturing in the United States. Méabh has a particular interest in the culture of music in Ireland. She has contributed articles and reviews to various journals and is subject editor on the forthcoming Encylopaedia of Music in Ireland (UCD Press, 2012). Her research on Dr Richard Henebry is part a a larger archive digitisation project currently underway at UCC. Revd Dr. Richard Henebry was born into an Irish speaking farming family in Mount Bolton, Portlaw, Co. Waterford in 1863. He was involved with the foundation of Ring College and also taught there for a time. The family were musical, Henebry played the fiddle and he had a great interest in traditional singing and uilleann piping. During the 1890's and early 1900's he worked in America as professor of Irish in Catholic University of Washington DC and in Berkeley University in California. While working in the America he became friendly with Capt. Francis O'Neill in Chicago and other Irish musicians. Suffering from ill health he returned to Ireland in 1903 and made a valuable collection of early cylinder field recordings in Waterford in 1905. These led to correspondence with leading German ethnomusicologists in Berlin, and formed an influential component of his theories on Irish scale and intonation. From 1909 until his death Henebry was professor of Irish Language and Literature in University College Cork. He had a great interest in Irish music and produced writings and books on the subject, including his handbook of Irish music. He died in Portlaw on 17 March 1916 and was buried at Carrickbeg. Méabh's talk will take place on Wednesday January 18 at 8.00pm in the Town Hall Theatre. Entry fee of €5, and all are welcome to attend.